The Phuket Big Buddha has been covered several times over the years since the Phuket Blog started in 2006. The construction had already started when I first blogged it in May 2006 - I wrote "Much of the enormous base is complete, and a small (12m) replica is already shining gold in the sun". A photo from September 2006 shows good progress, and this photo in July 2007 shows that things were moving on nicely. We go up the hill every now and then. Back in 2007, hardly anyone went up there, since the statue was not complete, although the views were nice (and the views are still nice!). 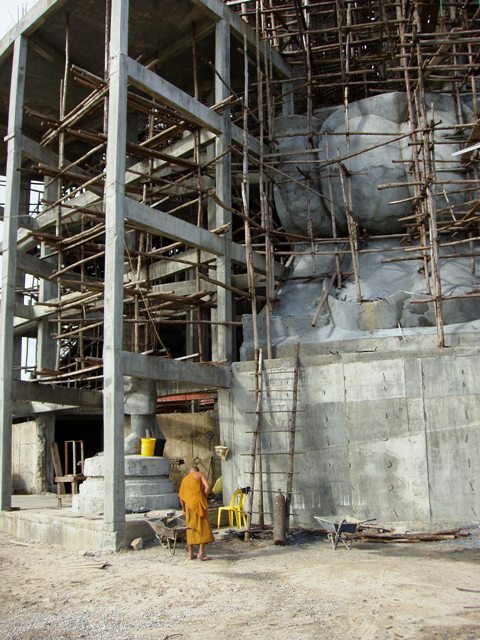 By May 2009, the main 40m high statue was covered in white marble (see photos). The last time I "blogged" about the Big Buddha was December 2010 and it was looking like not a whole lot had happened since 2009. Statue marbled, but otherwise a building site! Seemed to be taking quite a while to get things done .. and by 2011 there were already lots of visitors, with the main statue being all white and visible from half of southern Phuket. The road up from Chalong which used to be dirt was paved, although inexplicably there are still several small stretches of dirt! Most people will go up by road, though I have done a hike to the Big Buddha one time, starting from Karon Beach. During 2011, quite a bit more work was done with most of the "lotus leaf" base also being marbled. Over the years it's been possible to pay a fee and write your name on marble or brick to be used in construction. The fee has increased plenty since 2006 and with the main statue now complete, I can't see where "your piece of marble" will end up! I hope the ones that we wrote on years ago are part of the Buddha. By the end of 2011, the statue was looking great. There was also a big car park available now with no vehicles allowed to park near the temple. I am glad to see there is no entry fee, but there are a lot of donation boxes and Buddha related items for sale. With the donations, sales and people writing on marble, the money is surely pouring in. But the work seems to be slowing down. I have seen plans for building a park all around the statue with ornate steps and landscaping. The photo below was taken in November 2011, nearly 2 years ago. When we first went up the hill, when construction was just starting, there was one small restaurant not far from the top, and it's still there, but now the road on the way up has half a dozen restaurants or bars. I'm pretty sure at least some of them must be illegally built, but to be honest they are not really a blot on the landscape. I stopped one time last year for a sunset beer at the little bar shown below, great sunset and views across Karon beach and the ocean. So, how have things progressed in the last couple of years? We were up there again on July 20th 2013 with some of my wife's family. Certainly the car park seems bigger, and some (very nice, very clean) toilets have been built by the car park, which is below the main statue. You walk to the site now about 100 - 150m to reach the temple, which is still tin-roofed, I am not sure if there is a plan to build a nicer temple or not. When we arrived, Monks were saying prayers. And then wander up the stairs from the temple to the top of the hill and "The Buddha" ... So, the photo below is from July 2013. Compare to the photo from November 2011. What's going on here? Has anything been done? Maybe some work has been done around the statue, and I saw that some work was underway building some steps lower down the hill. A Buddhism museum or something has been mentioned to be built inside the base of the statue. Nothing seems to have happened there in the last 2 years. But for sure the donations have been pouring in more than ever. Why is there scaffolding around the statue when it was not there in 2011? It's getting a little frustrating. Why / How is this project not complete? Well, at least Buddha looks calm as ever. And the views are just as good. From up here I think you can see that Phuket is still very green. Much of the island is hilly. Sure there are areas of huge development, but if you look north from the Buddha, well, it's still one of my favourite views. (above) View from the Big Buddha. The "radar hill" is the highest hill on the left. Phuket Town is in the distance looking very small (it's about 15km away). I'm hoping to see some good progress at the Buddha in the next year. The statue is meant to be a "Symbol of Phuket", something to be proud of. And sure, with the main statue complete and covered in white marble, as it has been for years already, it's visible from miles away and looks out over Phuket I think as a reminder to be calm. If the project can get a move on and finish, people here can certainly feel proud. The longer it takes, more people start to wonder what's going on!